Are you a women who loves to sing? 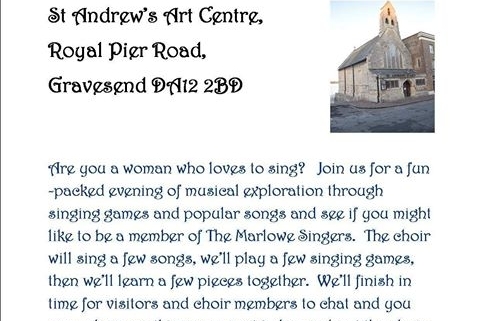 Join us for a fun packed evening of musical exploration through singing games and popular songs and see if you might like to be a member of The Marlowe Singers. The choir will sing a few songs, we’ll play a few singing games, then we’ll learn a few pieces together. We’ll finish in time for visitors and choir members to chat and you can ask anything you want to know about the choir.